A bit of spin on Which LEO missions are currently supported by NASA's DSN (and why)? is what I have in mind. • One 34-meter (111-foot) diameter High Efficiency antenna. • One 26-meter (85-foot) antenna. • One 70-meter (230-foot) antenna. All the stations are remotely operated from a centralized Signal Processing Center at each complex. The Centers house the electronic subsystems that point and control the antennas, receive and process the telemetry data, transmit commands, and generate the spacecraft navigation data. Can a station communicate with more than one space-craft using simple time-slicing without re-orientation of the antenna/s? Yes, a station can communicate with more than one spacecraft, but not the way you suggest. Each DSN complex consists of several antennas, each of which is called a Deep Space Station. A "station" is one antenna. Each antenna has a single transmitter, so any one station can only transmit to one spacecraft at a time. However if more than one spacecraft is in the antenna beam, which is often the case at Mars, then a station can receive data from more than one spacecraft at a time. This capability is called Multiple Spacecraft Per Aperture (MSPA). Of course, the spacecraft have to be on different frequencies. So one station can uplink to only one spacecraft, but it can downlink from more than one spacecraft in the beam. 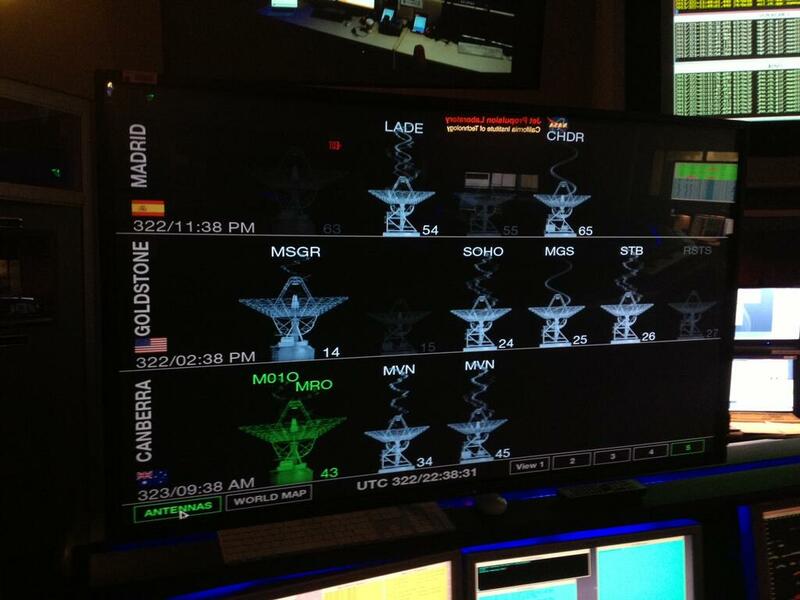 Below is the DSN display showing MRO and Odyssey on the same antenna (DSS-43). You will sometimes see the opposite, where there is one spacecraft on two or more antennas, like Maven on DSS-34 and DSS-45, also in the picture below. When at the same complex, that is called "arraying", where the signal from two or more antennas are combined to simulate a larger antenna for increased data rate. That also only works for receiving. Antennas cannot (today) be arrayed for transmitting. You can also see the same spacecraft on two different stations at two different complexes. In that case either the spacecraft is in the middle of a handoff from one complex to another to make for one long communication pass, or a special navigation data type is being collected using very long baseline interferometry. Time multiplexing is not useful, since it can take quite some time to lock on to and acquire a signal. Once you have it, you don't want to lose it and then have to find it again. It is better to have multiple receivers. I suppose that in effect we do use time multiplexing of the antennas, but on the scale of hours. Since it takes around half an hour to lock on to a signal, you stay with it for at least a few hours, usually eight to ten hours, and then switch to another spacecraft. Not the answer you're looking for? Browse other questions tagged communication deep-space-network or ask your own question. Which LEO missions are currently supported by NASA's DSN (and why)? Can we “Communicate” with Tau Ceti?